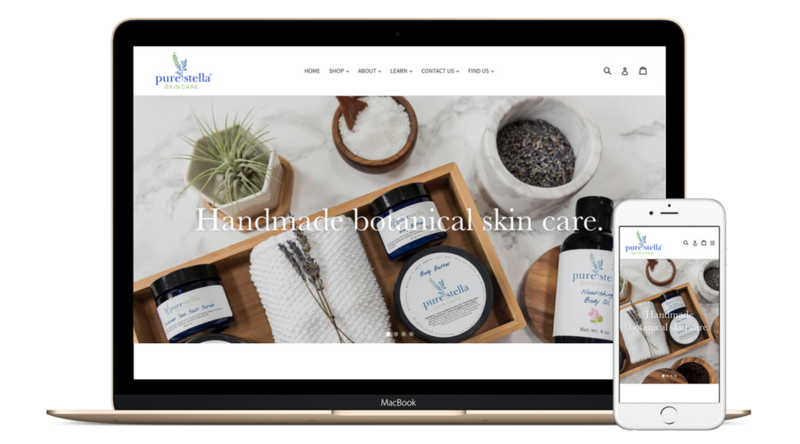 Just Launched: Shopify Website Design - Bracken House Branding Co.
I’m so pumped for the 1st official launch of 2018, a gorgeous new, custom Shopify website for my long-time client Pure Stella Skin Care. 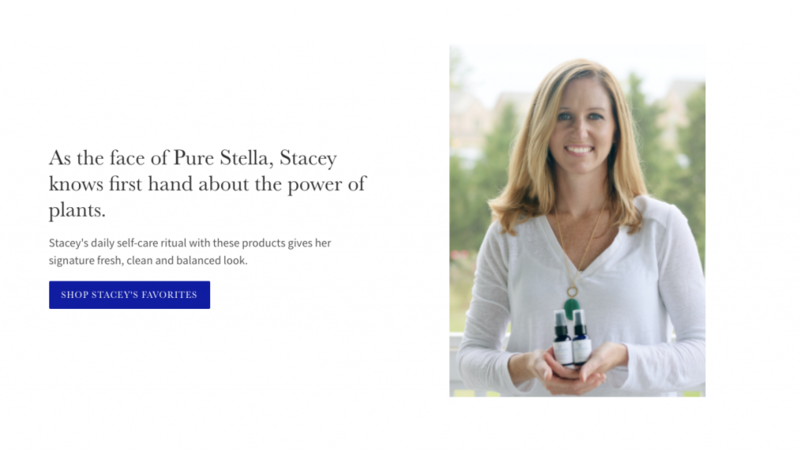 Stacey Rex, skin care developer and owner of Pure Stella Skin Care, started her business 3 years ago, after struggling to find skin care for her daughter’s eczema. Through the use of botanical ingredients, and extensive testing, Pure Stella was born! Once she realized this was a viable business opportunity, Stacey hired me to design her brand identity, and the start of a long-term business relationship was formed. Stacey went on to use her gorgeous new branding (which you can see on my portfolio page) on all of her labels, her signage, Etsy store & so much more. Stacey is a PRO at remaining consistent and cohesive with her brand collateral and marketing efforts. While the Etsy shop was doing well, and local pop-up shop business was booming, Stacey’s dream to have her OWN online store became even stronger this past Fall, so she reached out once again to discuss the next steps to achieving that dream. After a cozy in-person meeting over coffee (and our dogs), we mapped out the strategic path forward – which included some extensive brand strategy work, professional copywriting and several photoshoots to capture the essence of her brand & products – which all needed to happen before embarking on the actual website design process. The timing worked out beautiful. By the end of 2017, Stacey had her ducks all in a row, and by the end of the 1st week in January, we kicked off with Shopify! This being my first time designing on Shopify, it wasn’t without a learning curve. So a typical 1 week website project did take a little longer, but not by much. I’m so proud of how this website turned out, and I know that Stacey is too! Magical things really do happen when you take the time to invest in all of the pieces of the puzzle! 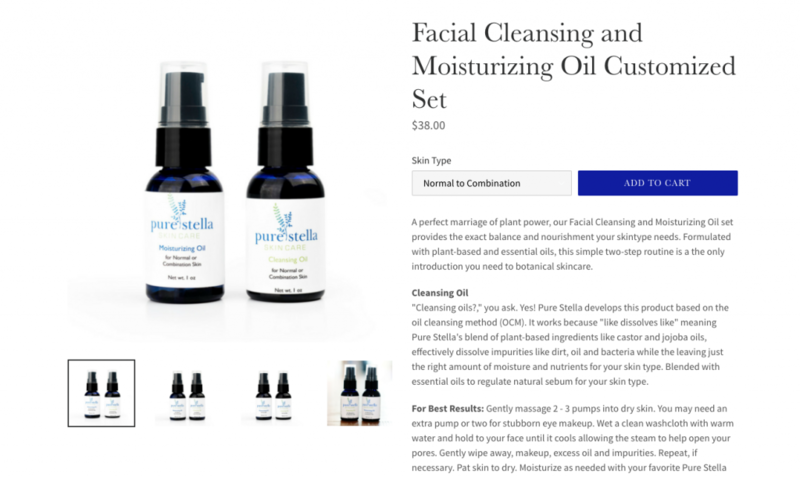 Visit Pure Stella Skin Care to see the website! If you’re ready to step out of the carpool line, and turn your long-time dreams into a reality, or make some massive shifts in how you present your business to the world, then we need to chat! Click below to get started on the process to revealing your authentic truth and getting noticed, so you can start making a profit, today! I am so proud of how this project turned out. Magical things really can happen with the right professionals, planning and some hardwork. Thanks for helping make my dream come true even better than I could have imagined. 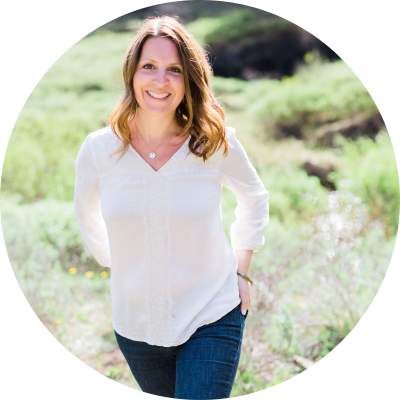 I am so happy for you Stacey, and thrilled to hear that you’ve been getting great traffic and results from the new site too!